I found a Sage Thrasher this week in some 4-winged Salt Brush/Cholla cactus habitat in Canon City where I usually find Curve-billed Thrashers, and it didn't take long to find two of those fairly common birds for my area. The Curve-billed Thrashers are resident while the Sage Thrasher is presumably stopping over during migration. The dark streaking on the underparts of the Sage Thrasher, along with the shorter and straighter bill distinguish it from the Curve-billed Thrasher. 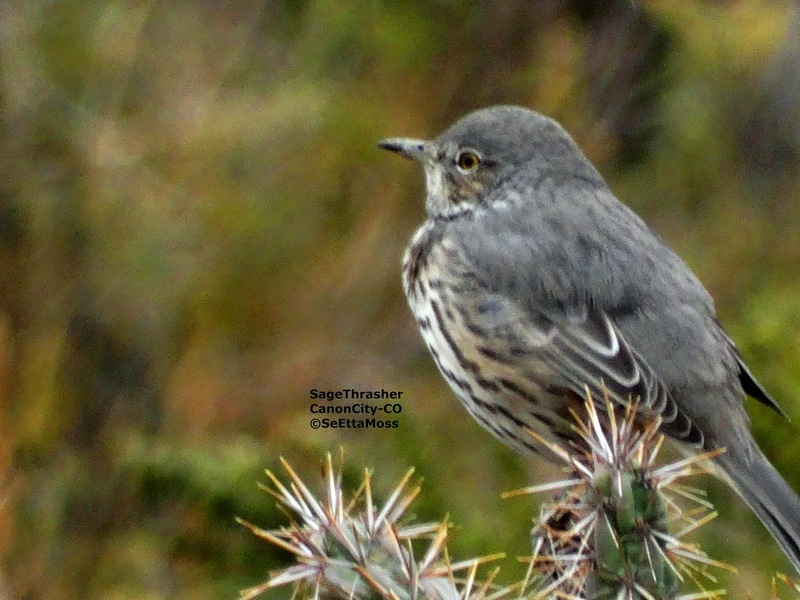 I included the photo just above that shows the white tips of the outer tail feathers of this Sage Thrasher--while Curve-billed Thrashers also have white on the ends of their outer tail feathers you can see in the last photo that their tails are slightly rounded.